Popular speaker and author Margaret Feinberg invites readers to imagine a relationship with God free of all the pollutants and additives of this world. Through personal stories and scriptural insights, she helps readers make a spiritual journey to rediscover God's authentic character. Natural. Pure. Essential. 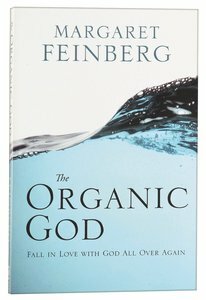 Margaret Feinberg---popular speaker, author, and one of the 'Thirty Emerging Voices' of Christian leadership---asks you to imagine what it would look like to have an organic relationship with God. One that is stripped of all pollutants and additives of this world. The Organic God helps remove the unhealthy fillers and purifies your relationship with the God of the Scriptures. Through personal stories and scriptural insights, Margaret Feinberg shares glimpses of God's character---big-hearted, kind, beautiful, mysterious---that point to an authentic and naturally spiritual relationship with him, allowing you to truly discover God in a healthy, refreshing new way, and fall in love all over again. The Organic God---now in softcover---will help you set forth on an 'organic' spiritual journey to discover God again for the first time. Free yourself of pollutants, additives, and other distractions that can cloud this ultimate relationship. This compelling read will help you create a real, authentic, and life-giving bond with the creator. It's an invitation to fall in love with God all over again. She has also published countless articles in national magazines including Christianity Today, New Man, BookPage, and Christian Single. She was recently named one of 50 women most shaping culture and the church today by Christianity Today, one of the 30 Voices who will help lead the church in the next decade by Charisma magazine, and one of 40 who will shape Christian publishing by Christian Retailing magazine. Margaret lives in Salt Lake City, Utah with her husband, Leif, and their superpup, Hershey. She believes some of the best days are spent in jammies, laughing and being silly.